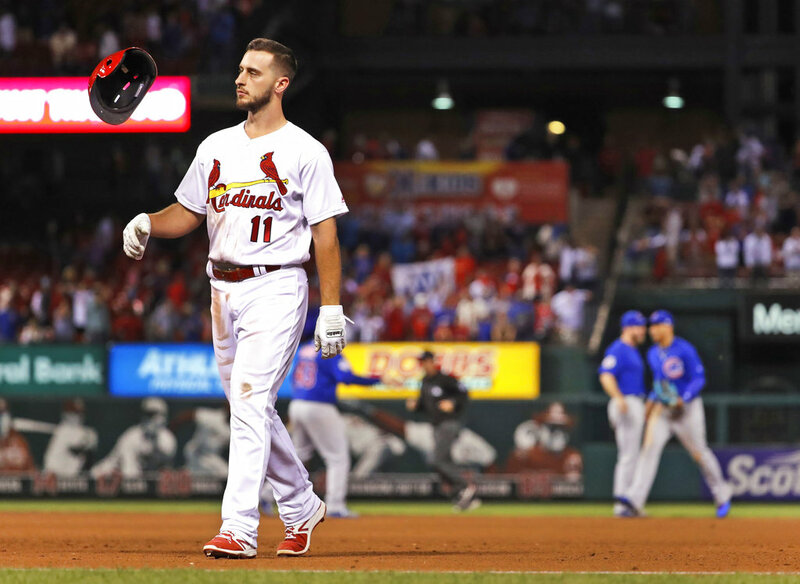 ST. LOUIS (AP) — The Cardinals were eliminated from postseason contention when Leonys Martin leaped at the center-field fence to rob Paul DeJong of a tying home run with two outs in the 11th inning, preserving the Chicago Cubs’ 2-1 win over St. Louis on Thursday night. St. Louis, which went 5-14 against its rival, missed the playoffs in consecutive seasons for the first time since 2007 and 2008. At 82-77, the Cardinals are assured their fewest wins since going 78-84 in 2007. A day after clinched their second straight NL Central title, the defending World Series champions started only two position players who had played in at least 100 games: outfielders Ian Happ and Kyle Schwarber. Schwarber singled off Matt Bowman (3-6) with one out in the 11th and Davis, who struck out in his first three at-bats, hit a run-scoring double down the left-field line. Jen-Ho Tseng (1-0) pitched three hitless innings. Happ homered in the first off Lance Lynn, who allowed three hits in five innings. Lynn is eligible for free agency and likely was making his final start for the Cardinals. Kyle Hendricks struck out nine and allowed four hits in five innings. Dexter Fowler had an RBI groundout in the sixth against Justin Grimm. Cardinals: C Yadier Molina remains in a concussion protocol and likely will not play for the remainder of the season. He was removed from Monday’s game after taking two foul tips off the mask on successive pitches. Cubs: LHP Jose Quintana (7-3, 3.50) will face visiting Cincinnati and RHP Robert Stephenson (5-6, 4.86) on Friday. Quintana pitched a three-hit shutout over Milwaukee on Sept. 24. Cardinals: RHP John Gant (0-0, 3.65) will face Milwaukee and RHP Chase Anderson (11-4, 2.81) on Friday in St. Louis. Gant will be making his second start this season. Tags: #dexterfowler, #kylehendricks, #stlouis, Cardinals. Bookmark the permalink.